Anyone who is at least a little crafty will know that glue does not work on everything. It just doesn’t. Also it tends to involve its own set of clean up requirements not to mention if you want it to last, you’ve got to get the right glue for the job. Bondic is a liquid plastic that hardens under UV light and manages to be the right glue for many jobs. Bondic works well for a variety of materials. Plastic, metal, wood, and even fabric to name a few. Generally you would need a different type of glue for all of those materials but Bondic will work with all of them. This makes it a sort of perfect one stop shopping for building and repairs. Also, unlike traditional glue, this one won’t harden without some UV light. So you can mess around with it until you get your project perfect. Of course this means that for certain projects, you have to work in layers to get a proper seal. Although Bondic won’t take the place of all glue, it’s still a handy alternative. 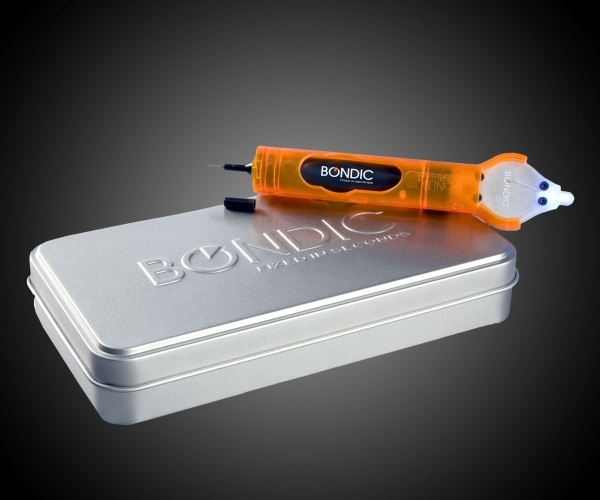 Bondic is $24.99 for a bundle that includes the applicator and light.